Say hello to Koi, our newest theme. This light and colorful theme provides a beautiful framework for your WordPress.com site with delicate, hand-drawn illustrations and refined typography. The tasteful artwork featured in the header and footer are suggestive of koi, an ornamental fish often considered a symbol of love and friendship. Example of Koi's layout showing the lovely illustrations behind the header and navigation bar. Enjoy the playful artwork and textured background, or customize the look with a custom background color and image, custom header image*, and custom navigation menu. 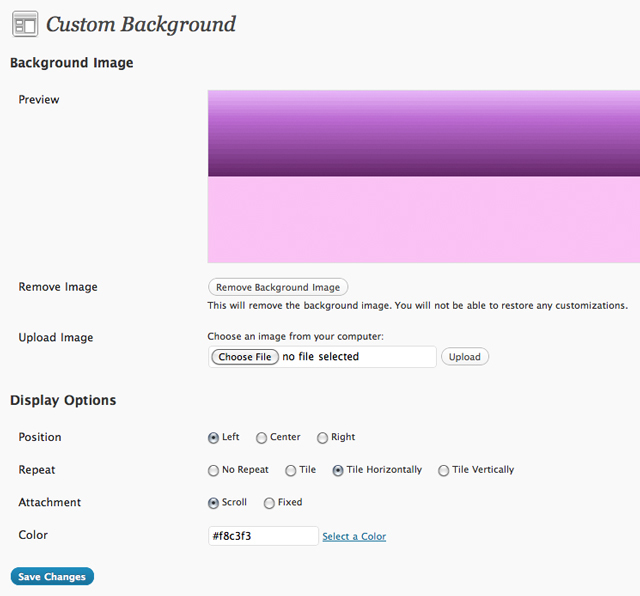 Add a background image and change the background color via the Custom Background menu. Koi’s right-hand sidebar and three footer columns are ready for all your widgets. If no widgets are enabled in the footer widget area, it will not appear. 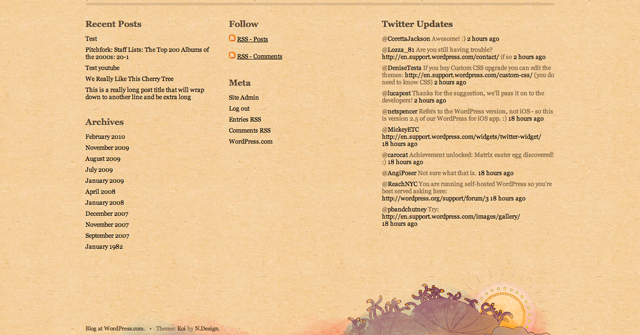 Example of Koi's three footer widget areas and more of the design's gorgeous artwork. Designed by Nick La of N.Design Studio, Koi is now available for your WordPress.com site and is coming soon for self-hosted WordPress.org sites. Main column width is 545, sidebar is 266. Main column width for the single image layout (no sidebar) is 873. Custom header image dimensions are 980 by 200 (width, height). 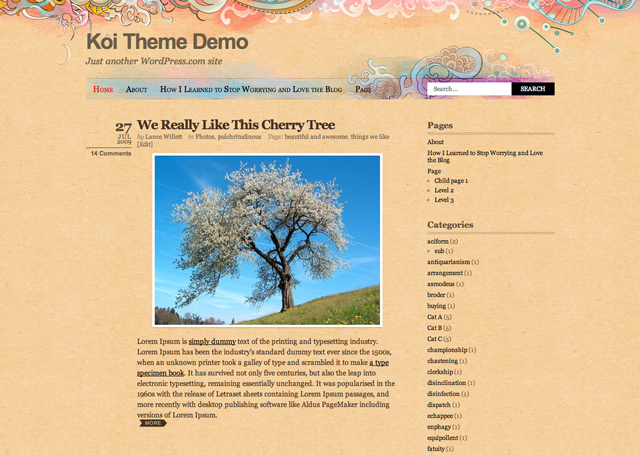 * Koi allows both title and description text to be hidden completely from the custom header area. Oh that’s pretty – like it! I still prefer the two Journalist style themes. This is a truly lovely theme! I love the Asian art and colors. Beautiful. Just inherited a blog and am looking to change the look. Looking at Bueno but I’m really impressed with the latest additions. Way to go, WP! Not really my type, but keep on the good work! This is different alright! Great work guys! Excellent look. The aesthetic is strong and pleasing. I love all the “eye room” you provide in this new theme! THIS is the theme I didn’t know that I was waiting for! It is beautiful and fun and fits like a favourite little black dress! Thank you for spoiling me WordPress. Viva los art themes! WOW, I like it! I’ll apply it now to my personal blog. This is awesome… I might try it. I know the girls will like it. However, I might be more apt to change the background as I am a guy! Jeepers, this one is different! Have to say i like it, and I’d use it… if i was a girl, blogging about girlish things! But, alas, it might prove a little too confusing for MY readers, but maybe i can finally get my wife blogging, with this. Thanks WP, keep em coming – especially them creative ones. Nothing more exciting than new themes! It’s not my thing but it IS really nice. Thank you for making it available to everyone. I liked the one before this better. Still using it. Good stuff though. Thanks! Wow! I really like it. If the name of my blog wasn’t so closely tied to my theme, I’d change my blog to this one! I’m loving all these new theme to play with! Koi looks really beautiful. Wow, really great. This is a departure for WordPress, and an extremely welcome one! Wow, this is BEAUTIFUL, I love it! Bravo, bravissimo! Keep up the good work with happy coloured themes! YAY. Very pretty! I love the symbolism behind the name. Very artistic! I like the “custom background” option. Thank you! That’s perfect for my MindlyMatters Blog. I have already taken it. Thanks. Cheers! I love it, and keep making themes like these! I hate to admit it, but I like the girly ones. But I also would love to see more themes like Greyzed, with a rugged military/apocalypse vibe. Our goal with new theme launches is definitely not to have everyone switch over to it. Instead, we want to offer great options so that everyone can find a theme that fits them perfectly. So don’t feel bad or apologize if you are going to stick with your current theme—we think that’s great! Yay! A pretty, girly, COLORFUL theme! Thank you WP, you’re awesome! Wow, that’s really nice. Have to give it a go. I love this theme, very beautiful! Though I am too fond of my current theme to switch over to this one. I don’t like it. Not at all. Wow, very artsy. Nice work with the layout and design, the hand drawn graphics are a great touch. I absolutely LOVE IT! I may switch over from “rounded” to this theme… it’s almost too beautiful to resist. I love this one! Great job! Love the theme! This is the girly theme other bloggers were looking for. I love the art work and custom background. WOW! Love the header and footer! Perfect accent to the background. I love it, it looks chic! I’m using it already. Congratulations great job! Wow, that’s gorgeous! Well done. Whoa, I really love this theme… I’m almost tempted to change from my beloved Cutline now! Thanks for the very attractive theme with customizable features. Now you’re doing much better! I like it. A very beautiful WordPress theme, especially the color. Nick La is amazing. He is an amazing designer. We launched another of his gorgeous themes, Notepad, last month. GORGEOUS! Best one so far — congrats! I have been waiting for this for ages! Awesome, thanks! Fabulous, beautiful. If I hadn’t just changed my theme, I’d switch again. But I’m going to go and try it on for a few minutes…. I like the Koi. In aestethic terms. It appeals to the artist in me. Hey Lance! This theme renders a peaceful pace when you look at it. Keep them coming, Theme Team! Thanks very much! Cheers! Very pretty–but I hope people customize it so the blogs don’t all look the same. I think this is one of the most beautiful themes that you offer! Wow! I like this new theme. I might try it one of these days. I totally love it! I already know my new theme. I love that you’re beginning to offer more themes that have background images/patterns/colors that still have some flexibility for personalization. Thank you! Thanks to all of you for the incredible support you provide. Gorgeous work! Very nice! I have to say I’m not a fan of having the widgets at the bottom of the page — I prefer them on the side as you scroll down — but the theme has nice aesthetics. As I mentioned in the post—the footer widget area is empty unless you explicitly enable widgets for it. I switched to it immedately! I love it!!! Lovely; have switched to it immediately. Sephani: only the background color can be changed for this theme. Based on the way the theme is designed, it’s best to use a lighter background color since the text is dark. This is so awesome. I am using it for my tea blog already. The design works very well with the worm, peaceful but colorful and lively looks and feel of tea theme. Just looking at it makes me happy. Thanks very much! Beautiful! Guess I’ll try it. 🙂 Thanks! Stunning! What else can I say? Thank you, guys! Aw, after Notepad now Koi. Great! But I’m still waiting for Modern Clix! Hi Earl — what do you like about Modern Clix? Pretty. Keep up the good work. Now that’s a lovely Asian theme. This could be handy for our Costa Rica Artificial Reef Project site. With a tad bit of color change it would be totally oceanic. Condofish is using “Bueno” right now and it’s working well. I’m always looking for something new though. If you just change the background color, the illustrations will still appear but the color will fill all the rest: post background, page background, header, footer. If you you upload a background image, the illustrations will disappear and the entire background will use the image you upload (depending on the settings you choose for tiling, repeating, et cetera). I’m using this for my Nihongo blog. Nick is very talented… I’ve liked his work for awhile now. Is it inspired by an instrumental music titled ‘koi’? I believe it’s inspired by koi, the fish.